The whole wheat pitas are fiber-packed, and together with the chickpeas you have a complete protein! And feast your eyes on the rainbow of veggies. It's the well-balanced lunch of every parents' dream. But will your child eat it?? The DIY component of the recipe puts the odds squarely in your favor. Oh, and by the way, there is absolutely no shame in using store bought hummus! I am a firm believer in going the homemade route when I can. And let’s face it - sometimes we just can’t (at least not without losing sleep and/or sanity). As far as the actual assembly goes, you can have your child pick their veggie toppings and pack everything up in separate small containers bento box-style for assembly at school. 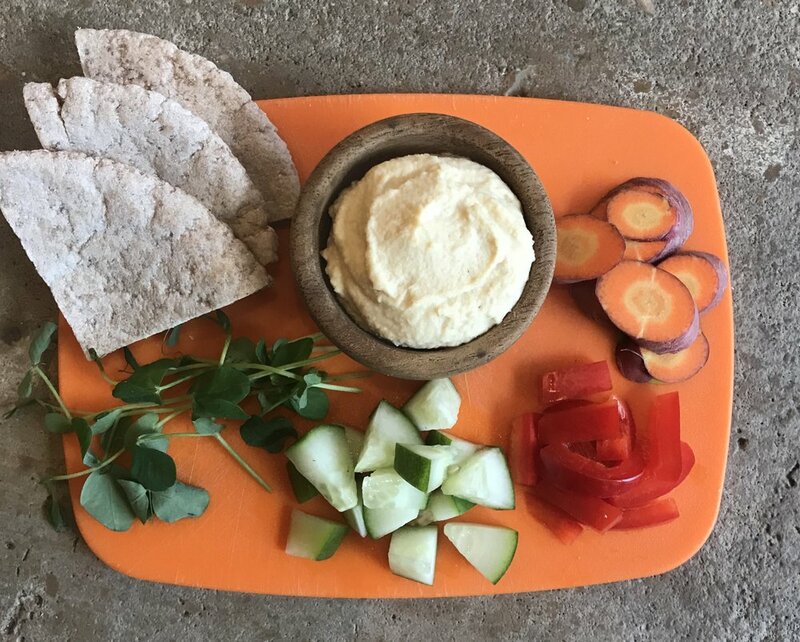 Or kids can build their pitas in the morning and wrap them up (if you go this route, it might be easier to go with larger pitas or whole wheat sandwich bread). Either way, let your child be in charge. This is especially important for the historically picky kid. When kids have control and ownership of the process, healthy foods tend to go down much easier! Cut lemon in half crosswise and juice. Strain out seeds. In the bowl of a food processor, combine drained chickpeas, tahini paste, garlic, lemon juice, olive oil and salt. Purée until smooth. Thin with reserved liquid from chickpeas, if necessary. Season to taste with additional salt (if you cook your own chickpeas, you'll probably need to double the salt). Transfer hummus to a serving bowl or container. Prepare your veggie toppings. Small baby spinach leaves can just be washed and left whole. Tear larger leaves into pieces. Red pepper and cucumber slices should be thin, and cut in half crosswise. Julienned carrots should look like matchsticks. To assemble, open mini pita pockets. Put a spoonful of hummus into each half. Top with veggies of your choice. Enjoy!